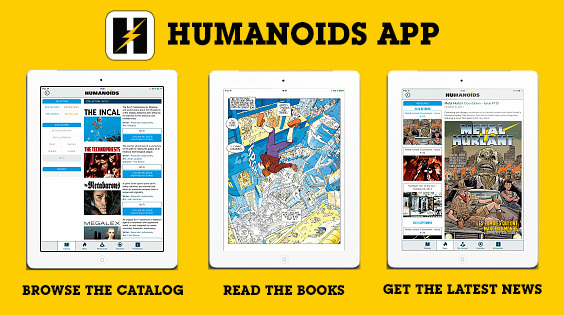 Buy and read our graphic novels on the Humanoids iPad app or on the Humanoids website. 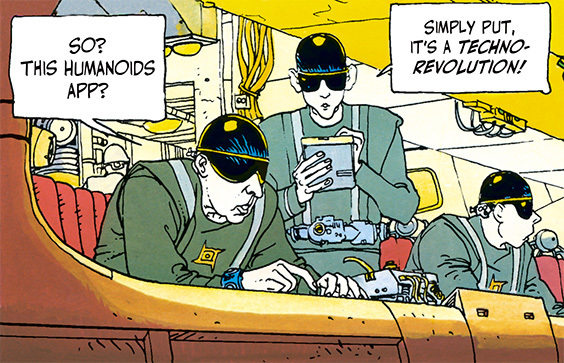 Get access to titles by top European creators such as Mœbius, and Alexandro Jodorowsky; Americans superstars such as John Cassaday, Geoff Johns, Kurt Busiek, and Terry Dodson; and international creators such as Chinese artist Zhang Xiaoyu - all of which are celebrated for their high quality and originality. The Humanoids catalog spans an impressive range of genres: from science fiction, thriller, comedy and horror, to children’s fantasy, action/adventure, slice-of-life dramas, and much more. Download the Humanoids app	and explore the complete catalog of the legendary publishing house, creator of the iconic magazine Métal Hurlant (from which Heavy Metal was later adapted). When you buy content from Humanoids, you also get unlimited access to your digital book directly from the website on your computers, tablets and smartphones (Windows, Apple and Android). Test out the easy 2-click process to enjoy reading Humanoids books on your device. 1. On the Humanoids website, go to the page of any of our digital books and click "BUY / HUMANOIDS". 2. Pay by Credit Card or PayPal. The website will automatically create an account for you if you do not already have one. 2. Go to the section "DIGITAL COMICS" / "YOUR PURCHASES"
- only the iPad app lets your read your books offline. If you plan to use the website to read your digital books, be aware that you need an internet connection.